Considerations to make:- What are the advantages? Problems? Group control. Communication. Environment. Capsize. Games. Head count first before recovery. Always stop the engine on arrival if there is someone in the water. Stop the engine when communicating. Ask the student to 'lie-to' before coming alongside. 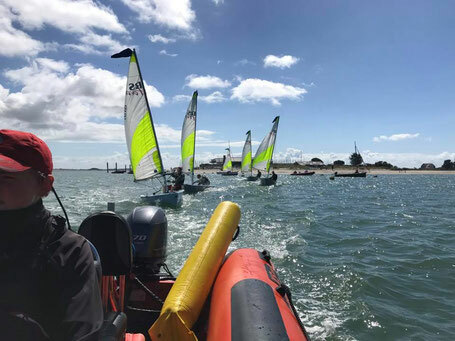 When coaching from a powerboat, always drive on the windward side (for better visability/safety etc), check your students can hear you, then ask your student to continue on the course they were travelling and to continue looking where they are going! (All too often your student will look round at you and therefore veer into wind and often into your safety boat..). 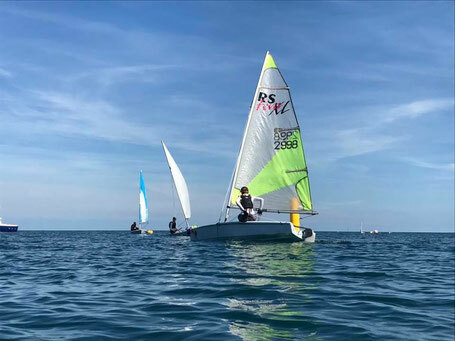 Once your position is established, you have a great vantage point to observe what is happening within the boat and also to coach on your students techniques. Consider completing the RYA Safety boat course.